Elenor S. Ireland was born on 2 July 1826 in Davidson County, Tennessee. Daniel Ireland and Margaret Cochran appeared in the US federal census of 1 June 1830 in Williamson County, Tennessee. Other (counted but unnamed) members of the household apparently included Elenor S. Ireland, Samuel S. Ireland, Jane Ireland and Elizabeth Ireland. Daniel Ireland and Margaret Cochran appeared in the US federal census of 1 June 1840 in Robertson County, Tennessee. Other (counted but unnamed) members of the household apparently included Elenor S. Ireland, Samuel S. Ireland, Adaline Ireland and Jane Ireland. Daniel Ireland and Margaret Cochran appeared in the US federal census of 1 June 1850 in Robertson County, Tennessee, and also Kentucky-born Daniel Ireland, age 12, and laborer John Collins, and living very near Thomas Barham and his family.. Other members of the household included Elenor S. Ireland, Samuel S. Ireland, Jane Ireland and Adaline Ireland. She married John Gabriel Harrison, son of James Gabriel Harrison and Elizabeth York, circa 30 December 1853 in Robertson County, Tennessee, with F. L. Plaster, GM, officiating. John Gabriel's brothers William and Joseph married Elenor's sisters Elizabeth and Jane, respectively. John Gabriel Harrison and Elenor S. Ireland appeared in the US federal census of 1 June 1870 in Indian Prairie, Wayne County, Illinois, Also in the household was James Croggins, age 7, born in Tennessee.. Other members of the household included Elizabeth M. Harrison, Eliza Jane Harrison and Mary Ellen Harrison. John Gabriel and Elenor Harrison had a photographic portrait made in Flora, Clay County, Illinois, after they had relocated to Wayne County, Illinois, from Tennessee. Her husband John Gabriel Harrison became a widower at her death. 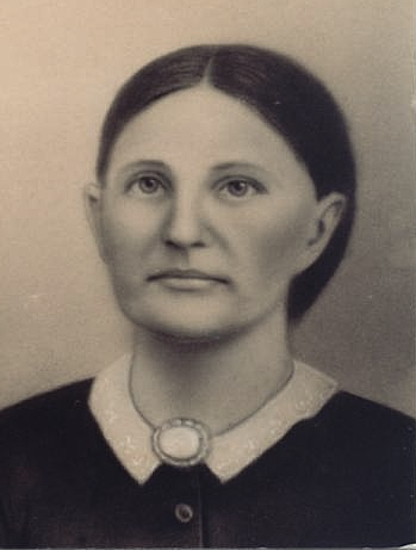 Elenor S. Ireland died on 12 December 1872 at age 46 in Wayne County, Illinois. She was interred at Willow Branch Cemetery, Keith Township, Wayne County, Illinois.